pdfFactory Pro is a comprehensive and effective solution for creating secure PDF files bundled with various advanced features to simplify all related tasks. pdfFactory Pro offers 40 and 128 encryption bit modes that allows you to control access to the PDF file in a number of ways, specifically, prevent copying of text and graphics, prevent printing, prevent opening the file without a password and prevent editing. - Create PDF files with a single click. - Combine and manage a group of documents into one PDF, even from multiple sources. - Preview is enabled, eliminating the need to open the file in Acrobat. - The 40 and 128-bit encryptions enable controlled access to PDF files. - Font embedding enables the display of all original fonts even if the user doesn’t have them. - You can delete unwanted content before the PDF is created. - You can send PDFs via e-mail with a single click. 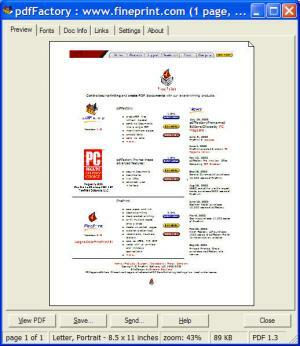 - PDF creation on letterhead. - Page numbering, headers, footers, watermarks, text notes, signatures and initials are enabled. - Automatic bookmarking and table of contents creation. - Grayscale conversion is enabled. - Text-to-links conversion is enabled. - Custom drivers are provided for specific tasks. - Allows you to highlight, copy and redact text and copy, delete and save graphics.